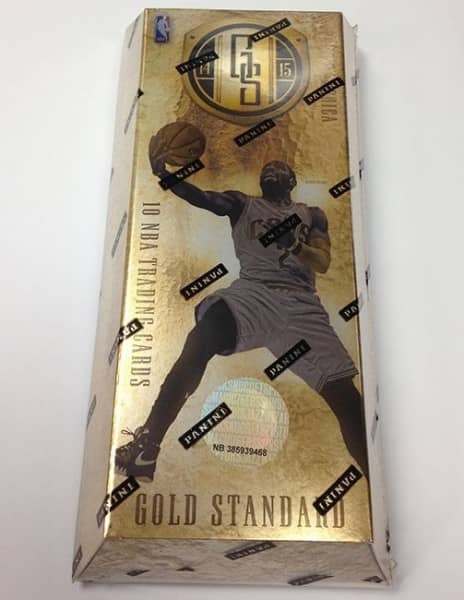 Factory Sealed 2014/15 Panini Gold Standard Basketball Hobby Box mit 1 pack per box, 10 cards per pack. Mindestens 1 Rookie Jersey Autogramm per Box !! Produktinformationen "2014/15 Panini Gold Standard Basketball Hobby Box"
Every box of Gold Standard delivers at least one Rookie Jersey Autograph. Be on the hunt for Prime versions (#'d/25) and tag 1-of-1s, including the Single-swatch logo tag! Find more prime memorabilia pieces than ever before! Premium patch content can be found in the returning favorites Black Gold Threads and White Gold Threads, plus brand-new additions like Newly Minted Memorabilia! Base Set Variations have been a staple in every Gold Standard release. This year, look for the classic Team variations as well as all-new photo variations! For the first time, every card in Gold Standard is serial numbered. Find the all-new rookie jersey autographs, which fall one-per-box on average! Look for prime variations that are #'d/25! Marvel at this new etched foil on-card autograph insert, #'d/79! Look for brand new autographed memorabilia cards, including Good as Gold, which features Prime and Platinum parallels. Pull a signature fit for the U.S. Mint in this spectacular on-card auto set. Look for new Multi-Swatch prime memorabilia cards from the NBA's top rookies! Solid Gold cards return once again! Strike gold - literally! - with these cards printed completely on real gold! Score a Freshman Phenom in this new Gold Disc insert, #'d/20! Weiterführende Links zu "2014/15 Panini Gold Standard Basketball Hobby Box"
Fanbewertungen für "2014/15 Panini Gold Standard Basketball Hobby Box"